I’ve been feeling ill since Saturday. It was like I had severe allergies and a flu all in one. I was so stuffed up and had such a hard time breathing. It sucked!… I had a 4 day weekend and wasn’t able to garden any of those days. 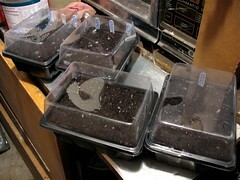 Although, I don’t quite feel 100% better… I planted a whole bunch of seeds in these cool cell packs I got last week from Big Lots. 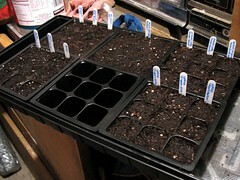 The 12-pack Mini Greenhouses were 99¢ each and the 9-cell packs were 97¢ for six. As an added bonus, eight 9-cell packs will fit perfectly into my Jiffy (72 pellet) Greenhouse. This entry was posted in Uncategorized and tagged alyssum gold dust, amaranth all red, amaranth red stripe, basil thai lemon, borage, chrysanthemum maiko, coreopsis plains, cosmos orange, cucumber lemon, cucumber sikkim, jiffy, lettuce mighty red oak, lettuce simpson elite, meadow foam, perilla korean, perilla vietnamese, purchase, seeds, smooth beauty luffa, sow, swiss chard fordhook, zinnia candy cane, zinnia envy, zinnia profusion. Bookmark the permalink.